Manila, Philippines – In his Manila Times article, veteran columnist and former envoy Rigoberto Tiglao revealed the correct information about the country’s economic status, that according to him, the Yellows are trying to distort. Tiglao said that his data were from the Bangko Sentral ng Pilipinas, specifically from the data base in its website. He started by disclosing that President Rodrigo Duterte administration totaled $16 billion when it comes to direct foreign investments. “DESPITE the concerted misinformation, by the Yellow Cult here and the US East Coast media, against President Duterte’s administration, foreign direct investments in his first 21 months in office (July 2016 to March 2018), totaled $16 billion. This is four times the $4 billion investments during a similar period (July 2010 to March 2012) under former President Benigno Aquino 3rd.” Tiglao wrote. 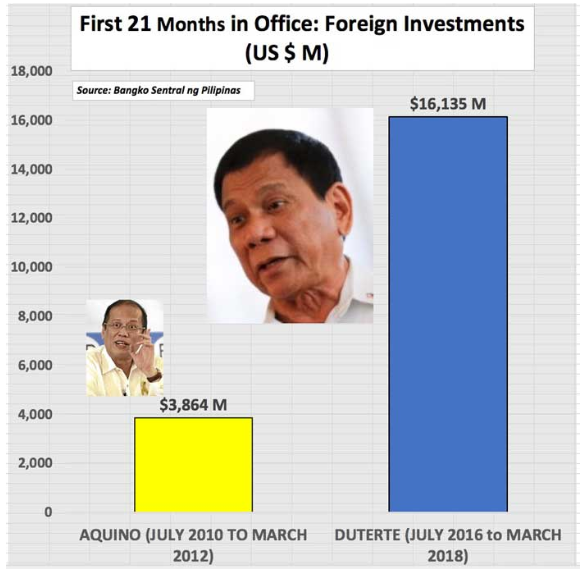 BSP records explain that Foreign Direct Investment (FDI) of Duterte’s first full year in the office, in 2017, totaled $10 billion. Reportedly, annual FDI in the country for decades has been only in $2 billion level. Tiglao, on the other hand, also gave credit to the past administration because FDI started to increase in 2014 and 2015, it even reached to $8.3 billion in 2016 when Duterte took power. “As any long-time observer of Philippine economics will instantly realize, the $10-billion figure of FDI in our country’s economic history is an “off-the-charts” development” Tiglao said. “For the first time since the mid-1970s, there is a momentum in FDI flows: from about $3 billion average annual 2012 and 2013, to $5.7 billion in 2014 and 2015, to $8.3 billion in 2016, and $10 billion in 2017. The momentum appears to be continuing as the FDI for the first quarter of this year totaled $3.6 billion, twice the $2 billion in the first quarter of 2017.” He said. Therefore, with this data and figures mentioned by Tiglao, the opposition’s claim that economy has gone down under President Duterte has been contradicted. “During the first half of 2017, there was a 90 percent year-on-year drop in new investment pledges from $1.45 billion to $141 million. During Duterte’s first year in office, South Korean investments plunged by 93 percent, while American investments dropped by 70 percent.” Heydarian claimed. “The 'fallout’ that Heydarian is imagining is debunked by the rapid growth of the economy—6.7 percent in 2017 and 6.8 percent in the first quarter of 2018. If Heydarian is looking for ‘erratic and populist policies,’ his eyes are perhaps turned to the wrong country,” the DOF said. Also, Tiglao shares the same opinion saying that Heydarian does not understand economic terms. “Heydarian either is so intellectually dishonest or just a plain ignoramus in the field of economic reporting when he tried to wiggle out of the false data he disseminated in an international venue by writing:” The DoF is correct to highlight the increase in ‘approved’ FDI recently, a record-high $10 billion in 2017 and growing by 44 percent in the first quarter of 2018. Yet, ‘pledges’ of investments are also an important indicator of business confidence in the country.”” Tiglao countered. “First of all, the DoF figures are from the BSP, and these are not “approved” FDI, but actual inflows as reported to the BSP by banks used by the foreign investors to remit their investments to the country. Secondly, “pledges” are, as any greenhorn economic reporter knows, not worth the paper of the press releases that report them. For every trip abroad that Aquino made, his PR would claim billions of dollars in pledges, but just a trickle of these came in.” he further explained. Tiglao noted why this writer Heydarian was so critical of the Duterte administration, to the extent of spreading untrue news which could discourage investors from coming into the country. “Is he Filipino, or a dual citizen, or even a triple citizen, the other nationality being Iranian? I’ve got to fact-check that.” He added. Surely, anyone who is concerned for his country would not make such unproven claims for the world to see. “What is sad — although typical of Yellow propagandists — is that even when facts stare them in the face, they refuse to admit their lies.” Tiglao noted.